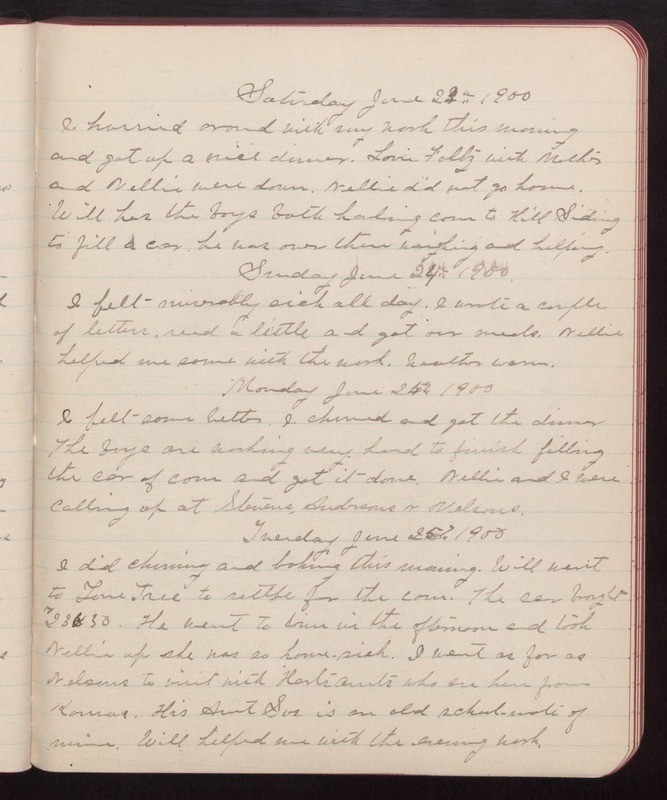 Saturday June 23rd 1900 I hurried around with my work this morning and got up a nice dinner. Louis Faltz with Mother and Nellie were down. Nellie did not go home. Will has the boys both hauling corn to Hill Siding to fill a car. he was over there weighing and helping. Sunday June 24th 1900 I felt miserably sick all day. I wrote a couple of letters, read a little and got our meals. Nellie helped me some with the work. Weather warm. Monday June 25th 1900 I felt some better. I churned and got the dinner The boys are working very hard to finish filling the car of corn and get it done. Nellie and I were calling up at Stevens, Andersons & Nelsons. Tuesday June 26th 1900 I did churning and baking this morning. Will went to Lone Tree to settle for the cow. The cow brought $236.30. He went to town in the afternoon and took Nellie up she was so home-sick. I went as far as Nelsons to visit with Harts aunts who are here from Kansas. His Aunt Sue is an old school-mate of mine. Will helped me with the evening work.